Houses and rooms in general are getting smaller, as each new housing development is built the rooms are squeezed a little more. There are a hundreds of superb and innovative storage solutions for small spaces, some are simple, others need bespoke cabinets made. Here are just 3 innovative storage solutions to help you make the most of those small spaces around the home. Under the stairs storage solution. Everyone knows how the space under the stairs can become a general dumping ground for all manner of things, from vacuum cleaners to coats. This space under the stairs can often be used much better with a little craftsman ship, care and attention, the space under the stairs can be transformed into an efficient storage solution. 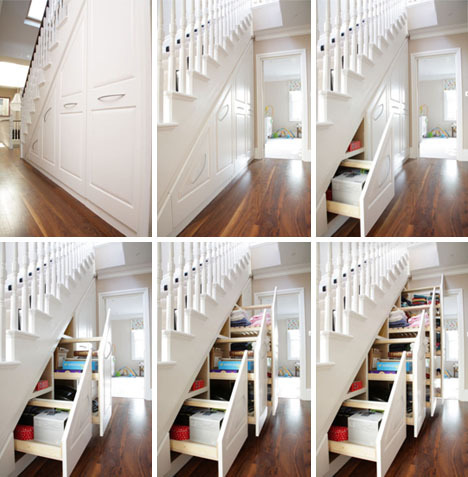 The image here shows how a space under the stairs can be converted into a superb shelving system to store all sorts of objects from boxes to books, bedding to toys. The best part of this innovative solution is when closed it looks perfectly in keeping with the rest of the hallway. When converting a space such as this you have the ability to work with your cabinet maker to tailor the space to your exact requirements, each of the sliding shelves can be designed perfectly to fit your needs. 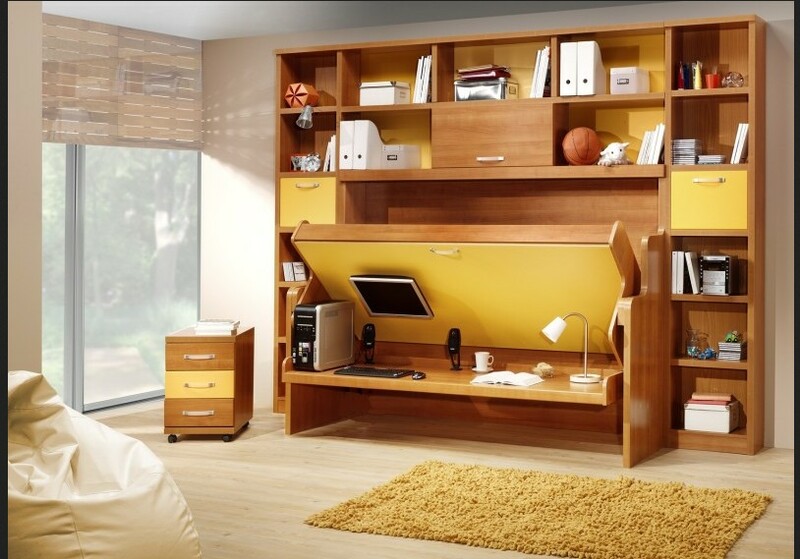 Bedrooms need to be flexible, I found this superb and innovative bedroom example solution online, featuring a computer desk underneath a bed. 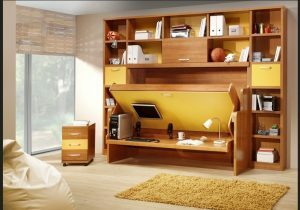 It uses a day bed type design, with an added shelf underneath the bed that can be used as a desk or games station. Ok, some may not like sitting on a bean bag low down to work at a computer, but I think it’s a great idea but for a teens bedroom. With built-in storage left and right it provides a funky solution for some of those tiny box rooms often found in the more modern home. Love this cute bedroom solution. The complimentary colours mixed with the natural wood textures, works really well. The bed sits on top on top of 4 full width draws extending deep under the bed providing a massive amount of storage. To the right the cabinet provides the perfect step up to another set of draws, cupboard and of course shelves above. This children’s bedroom solution could easily be adapted to work in a teen bedroom or adult bedroom with great effect. These are just 3 simple storage ideas for small spaces, I’m sure there are hundreds more out there. Arley Cabinet Company of Wigan can work with you to build almost any solution you can dream of, if you’ve seen something you like we can almost certainly help you. Our experienced Wigan based craftsmen work tirelessly to provide you with the furniture you dream of at a price you can afford. All our work is fitted expertly by our own team of expert fitters and finishers.